The stand out features of Al Cantuccio have to be the decor and the service, followed closely by the lovely, homemade food that you can just tell is made with love. Aside from being a mouthful, Flavio Al Velavevodetto is a fantastic restaurant serving up Roman classics in an interesting environment. If you reserve ahead of time at their Testaccio location, you can eat in their underground wine cellar. The food is made with high quality ingredients and sourced locally from the restaurant's own resources, while the wine collection is robust and affordable. I'd heard so much about Flavio's (from Gillian's Lists, Elizabeth Minchilli, and Katie Parla) that this restaurant was at the top of my list. After reserving a table, I headed there with a friend visiting Rome, who wanted to try ALL the classics. We collectively shared a bottle of their decent house wine, a salad and giant mozzarella di bufala ball to start, followed by the Ravioli alla Velavevodetto for my friend and Amatriciana for me. Everything was delicious and the only complaint (from my friend) was that he found the ravioli a little too cheesy after the mozzarella. And that's a compliment in my book. Their specialities include the four famous Roman pastas (Carbonara, Gricia, Amatriciana and Cacio e Pepe), oxtail (coda), tripe (trippa), artichokes (carciofi) and a fantastic tiramisu. It's now become my go-to food spot in Testaccio, when I'm not grabbing a pizza from da Remo's. Flavio's does Roman classics very well and has a great story to back it up. If you're not set on dining under the terracotta hill of Testaccio, you can also check out their location in Prati (Piazza Quiriti). The culture of aperitivo in Italy is rooted in tradition and is one of my favorite aspects of life here. It's the idea of "preparing" your stomach for dinner with a pre-dinner drink and light snacks. Usually. It's really taken on a life of its own in Rome, however, and you can find aperitivo's with more food than light snacks. Aperitivo can be a substitute for dinner or a light drink before something heavier. Either way, it's a fantastic way to spend time with friends, at cool locations in the city. And depending on the spot, you can get a beer, glass of wine (maybe a prosecco) and always the famous Italian aperitivo drink, the spritz. I like mine light on the aperol, with plenty of fruit garnishes. I do plan on writing up a more comprehensive guide to aperitvo's in Rome, but for today, I'm giving an overview of a famous aperitivo location in Rome, Momart Cafè. This restaurant/bar is well established among locals and is known for its unlimited and abundant buffet and beautifully-made cocktails. This is not your typical potato chips and nuts situation: Momart has an entire room full of food platters, with a separate dessert station and pizza oven that cranks out pizza for the masses. It's always full, there's always a line and you always leave feeling stuffed. Momart Cafe is one of the best aperitivo spots in Rome for the quantity/variety of foods and creative cocktail choices. From 6:00 to 10:30, you can try out the aperitivo at this restaurant, starting at €10 for a drink and unlimited food. Getting "apericena" or aperitivo/dinner is a great option to save money and find food around the city at earlier dining hours. Aperitivo starts around 5 or 6 in the afternoon in Italy, while dinner won't be served until 7 or 8. Momart has a beautiful terrace, which is heated in the winter and is all outdoors, surrounding by plants. There's also plenty of seating indoors, where you can watch the feast as it happens. The main room has a large table with pasta dishes, salads, sides, meats and cheese and a separate pizza oven with slices of different pizzas. The dessert booth changes frequently but when I was there, I tried a deconstructed tiramisu, with different flavored-creams. If you're in the city, you need to try this to experience one of the best aperitivo in Rome. It's a great way to see another side to the Italian culture of large lunches and late dinners. Aperitivo is where Romans meet up to chat after work and just appreciate the "vita bella" that they live. Finding a decent restaurant in the center can be hard. Osteria del Pegno is the answer to all of your pasta and meaty Italian dish needs. Located right near Piazza Navona (directly in the center alongside the Pantheon and Trevi Fountain), I've always found this restaurant to be a great option when I need someplace scenic, central and delicious. While it's not the best Roman food you can find in the city, it's a nice restaurant, with friendly staff, good food and excellent wine. Osteria del Pegno is a family run restaurant that is well known for its quality food and great atmosphere. The owner himself has come out the (many) times that I've eaten dinner there. While I've never tried their lunch, the dinner menu is comprehensive and also sticks to Roman classics and traditional dishes. The house wine is excellent and the waiters will help you decide on a bottle from their very extensive list. The seating area itself is decorated with aging bottles and you can see that they take pride in their selection. Both the pasta and meat dishes are fantastic. I've tried their Amatriciana, Carbonara and Ossobuco and all were amazing. Their chef's lasagna wasn't my favorite but probably because that place is taken by Edoardo's mamma's famous lasagna. You've got to save room for Pegno's desserts, all made in house. Their tiramisu is incredible and you'll always get a complimentary glass of limoncello to end the night. Not much more to say about this place other than, it's a great choice for those busy days in Rome when you need a decent meal or the times when you want to have dinner out and take a walk in the center. Pizza from Naples will change your life. I had, with no exaggeration, a culinary epiphany when I tried my first pizza napoletana. The chewy crust, tangy sauce and mozzarella that actually has a flavor gets me every time. Unfortunately, there are only so many day trips I can make to Naples, which is where Da Michele Pizzeria comes in. Da Michele is a pizza institution in Naples. It’s been around for since 1936 and is ranked on multiple websites as the “best pizza in Naples”, which can also be translated to “best pizza in the world”, by the transitive property. I’ve tried the real thing, so when I heard they opened a new shop up in Rome, you can imagine how excited I was. I went there last Friday night for dinner, around 7:30 to avoid the notoriously long lines (there are no reservations taken). After a quick look around the children’s museum it’s located in, an interesting aspect of the new pizzeria in itself, we found the entrance and were sent up to the second floor. I had heard great things about Da Michele’s new location and the pizza really lived up to expectations. They import their products (tomatoes/mozzarella/flour) from Compagna to maintain flavor consistency and while nothing can live up to the magnificence of a pizza from Naples, theirs came pretty close. On the menu are some new offerings, including nodini fritti (fried pizza) and other appetizers. Just like the original spot, they serve only pizza margherita and pizza rossa. Edoardo (lucky guy) went for double mozzarella on his pizza and it was decadent. My pizza margherita was amazing. Da Michele has the flavors down just right and takes the time to check that every pizza is perfectly (read: lightly) charred, top and bottom. The only difference I found in the two variations was that my pizza in Rome was a bit heavier than the original. But it's to be expected with a doughier pizza than its Roman counterpart. Da Michele pizzeria is a great option for families, couples or even a solo pizza excursion (which is sometimes required if you're alone when the pizza craving hits). If you can't get to Naples for the best pizza of your life, a trip to Da Michele or a classic Roman pizzeria (options 1 & 2) is a must. Da Michele in Rome is located close to Pizza del Popolo and the Flaminia metro stop. No reservations are accepted so get there early and don't expect anything but the classics and a handful of Italian beers to go along with them. Roscioli has a nice little enterprise going on in Rome. They've cornered the market for decent coffee, aperitivo, wine, salame, pizza and bread all with three small stores in the center of the city. If you head from Campo dei Fiori along Via dei Giubbonari, you'll come across Roscioli's bar, salumeria, and forno. Depending on what you're craving, you'll head to one of the three restaurants. Last weekend, I managed to get to all three. The hardest thing about making plans in Rome is finding a decent spot for good, reasonably priced drinks/snacks in the center. It's so easy to go wrong, so when a friend and I met up for aperitivo Friday afternoon, we wandered around the center for a bit before settling on Roscioli. We went for their bar/restaurant and ordered a couple of spritz's, but it was a close call between that and the salumeria with a huge wine selection. The spritz was great and not too pricey, and they gave us some snacks for the aperitivo hour which included the BEST (truffle) potato chips I've ever tried. Talk about addicting. The next day, Edoardo and I were searching for a bakery with bagels for a brunch. 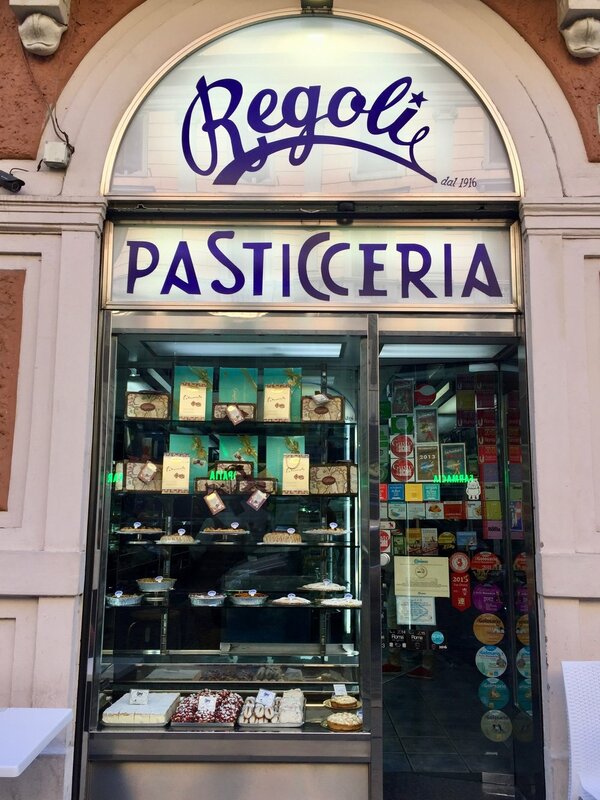 Bagels are not an easy find in Rome and after calling around, we found out that Roscioli's forno also makes bagels and for large quantities, will prepare your order ahead of time. It's been way too long since I've had a bacon, egg and cheese on a bagel so the forno was heaven sent. I bagels were a hit with all of our Italian guests as well. For a quick drink in the center, a bottle of wine, or a fresh loaf of bread/pizza bianca, Roscioli's got you covered. In the rarely frequented neighborhood of Testaccio, I found my new favorite pizzeria. It’s not polished, like Emma or as quick as getting a slice from Pizzerium Bonci, but da Remo's been around since 1976 and has some of the best pizza in Rome that I’ve found. We headed there on a Friday night and while it’s possible to make reservations, the quick turnover rate means that a table comes up pretty quickly. We started with supplí and a carafe of wine and quickly moved onto personal pizzas. We got a margherita con bufala and a salsiccia. Both pizzas were great, with the perfect ratio of sauce, crust, and cheese. The crust was somewhat chewy, a slight deviation from the crispy Roman classic, but still beautifully thin and manageable for one portion. The entire atmosphere screams family-run and casual, with paper covering the tables, hearty starters and consistent, fabulous pizza. The waiters were busy, brusque and delightfully Roman. Everyone in the wine cellar-esque dining room was waiting patiently for their pizza, while two pizza makers were hard at work with an assembly line of pizzas to be cooked in their authentic brick oven. I recommend trying it on an off night (during the week) and taking your time over wine, starters, and a few different pizzas split between the group. Da Remo is a great option if you're living in or traveling to Rome and can give you a sense of a classic Roman restaurant, outside of the touristy areas. It's neighborhood of Testaccio is well worth a look around, especially if you make time for some of the best pizza in Rome. Italian pizza is something I’m passionate about. A good pizza makes any bad day better, fits every I-don’t-wanna-cook night perfectly, and is the best way to celebrate any occasion. Emma’s pizza does all that and more. 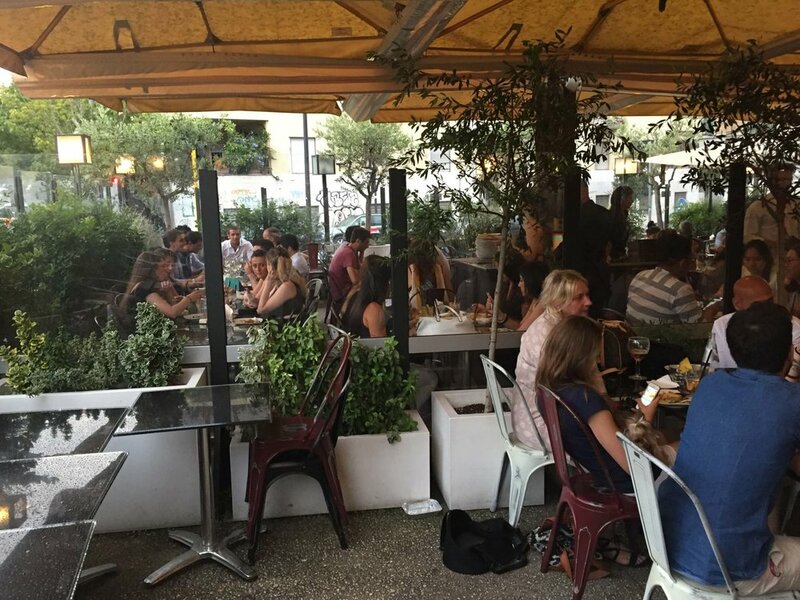 Located in the historic center of Rome near Campo di Fiori, Emma Pizzeria is a great alternative to your run of the mill pizzeria in Rome. What makes this specific place shine is the quality of Emma’s ingredients and the attention to detail that goes into each pie. They source every single ingredient that goes into their pizzas in the menu and on their website, citing organic flour, salt, and fresh yeast all from locations around Rome and giving special attention to Roman water as being a key ingredient. Now the difference between American and Italian pizza has been hotly debated by myself and Italian friends since I’ve lived here. But the only real distinction we can make between genuine Italian pizza made in Italy and the pizza found in Italian American pizzerias is the ingredients. There’s just something about Italian flour, water, tomatoes, and mozzarella that creates perfection. Emma has about 30 suggested pizza options on their menu, not including calzones, bruschetta, suppli, and the full dinner menu with pasta and meat dishes. It's supreme. They also boast extravagant wine and prosciutto lists. And by prosciutto list I mean a carefully curated selection of proscuitto and salame that put the grocery store version to shame. I’m talking €28 for 100g of Pata Negra, the most prestigious Spanish jamon out there. Thankfully the pizza prices are more accessible, starting at €8 for a margherita and €10 for a margherita con bufala (mozzarella). These are comparable to other pizzerias in the area and you truly are getting the best of every single ingredient. And as a bonus, the pizza guys who make your pizza in front of you are always smiling and willing to have sneaky photos taken of them. For when I’m feeling like its a treat yo’self night and need a fix of great Roman style pizza, Emma is my go to. I recommend going and trying for yourself because it is an experience for your tastebuds that you’ll never forget. Reservations recommended because it fills up quickly in the evening and on weekends. I remember the first time I saw La Casetta. I was on a walking tour of the Monti neighborhood with my school professor in 2013, walking down a road when we stopped to walk around the building that was inconveniently placed in the middle of the street. In a city where the buildings are uniform and audacious, La Cassette stands out. This tiny “little house” is covered in ivy and is one of the most picturesque spots in Rome, all the while serving up delicious coffee, food, and desserts. Apart from a great location, delicious treats and infinite instagram abilities, the best part of this cafe is the owner, Domenico. A typical Southern Italian, Domenico makes every single person who enters his cafe feel welcome. He will speak in a multitude of languages to put tourists at ease and once you become a (somewhat) regular, he is always up for a lively conversation about life. He is a seriously charming Italian signor and it brightens my day when I stop in to chat with him while taking a walk through beautiful Monti. It’s a joy to feel immediately welcomed in a place as special as this. La Casetta offers a full bar experience with espresso, cappuccino's (regular, soy, and almond milk), a wide variety of tea, and fresh juices. For lunch and dinner, Domenico’s wife prepares homemade pasta and meat dishes to serve. In my opinion, the real standouts in terms of food are the fresh baked goods. His son-in-law (keeping it in the family) runs a bakery and sends over freshly baked cakes, pies, muffins, breads, strudel, quiche, and cookies every morning. Usually they are recipes found in the South of Italy, making this the perfect place to relive my love of Pugliese pastries. If you’re lucky, you might make it to one of the events in front of the cafe that Domenico painstakingly plans. I’ve had the pleasure of attending a special dinner out where we were waited on by young Italians studying hospitality and a cultural festival celebrating traditional Georgian dances. It’s always quite an eclectic mix with all of the “amici della Casetta” (friends of the Casetta) in attendance. The location makes this spot perfect for a breakfast, lunch or afternoon snack while you meander along the small side streets in Rome, and is centrally located near the Colosseum, Forum, and Piazza Venezia. With a decent wifi connection, I also come by for a few hours to get some work done. If you really want to live it up, you can do a mini tasting in Monti (tried and recommended by me) and hit up one of the pizza by the slice joints for some white pizza and a suppli, grab a tea and slice of cake from La Casetta, and end with a cone from Fatamorgana. Next time you're in Rome and need a break after walking in the center, stop by La Casetta and meet the nicest Italian I've had the pleasure of knowing. La Casetta is on Yelp, Instagram, and Facebook if you would like to check it out or connect. Prices: cappuccino €1.5, cup of tea €2.50, slices of cake/pie/quiche €5, pasta dishes €8-10.